Tahawus Trails is a partnership of five dedicated individuals who supervise crews of two to six seasonal staff. 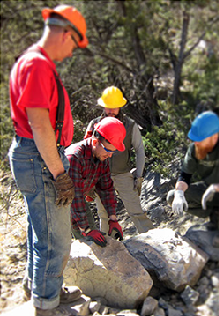 The partners have over 60 years of combined professional trail building experience. In all our work, we are committed to being professional craftspeople, innovators, artists, educators, and passionate land stewards. Tahawus Trails LLC offers a full range of trail-related services. We work directly with land and stewardship organizations, parks, municipalities, schools, resorts, developers, land trusts, and private landowners to develop, design and improve appropriate access to natural areas. Our specialty is pedestrian and multi-use trails. However, we also work on equestrian, Universal Access Trails, ski, bike, and utility vehicle trails. Our consulting services include trail design, master plan development, trail and trail system assessments, and construction management services. We also offer workshops to develop trail design, assessment, and construction skills for volunteers, land owners, and park and facility operations staff. Tahawus Trails LLC is a member of the Professional TrailBuilders Association, and was awarded their 2010 Trail Project of the Year Award for the Bear Mountain Trails Project on the Appalachian Trail in Bear Mountain State Park, NY and the 2013 Trail Project of the Year for the Whirlpool Steps in Niagara Falls NY.